BMW M Performance Automobiles: tri-turbo diesel trio F10 BMW M550xd, BMW X5 M50d and BMW X6 M50d! Home » Cars » BMW » BMW M Performance Automobiles: tri-turbo diesel trio F10 BMW M550xd, BMW X5 M50d and BMW X6 M50d! 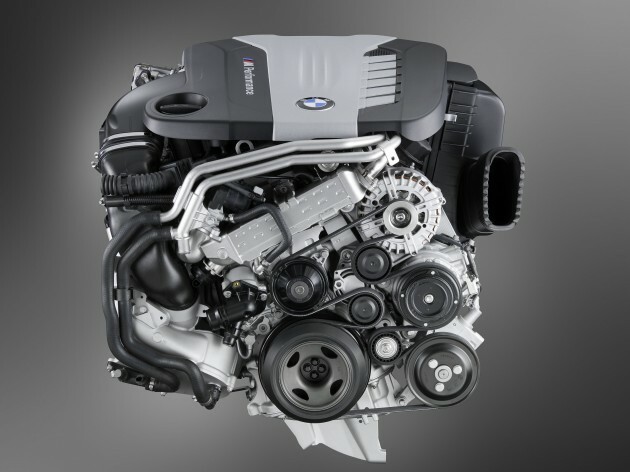 BMW’s new 3.0 litre tri-turbo diesel engine found in its recently unveiled trio of new BMW M Performance Automobiles lifts the bar on what a performance turbodiesel can be. Rather than simply increase cylinder count and displacement to create a big monster of an engine like Volkswagen’s V10 and V12 TDIs, BMW chose to extract more power out of their 3.0 litre engine, which already exists in single and twin-turbo form. Check out the video above – watch it from the 40 second mark onwards to watch the redline. I can tell you that a regular diesel-powered F10 520d and 530d will usually have an engine RPM meter up to the 5,500rpm mark, where the redline begins from about 4,700rpm. While these are very capable turbo diesel engines – especially the punch that’s delivered from the smaller 2.0 litre sibling – they’re still considered pretty simple in the way that they only use one turbo for boost. 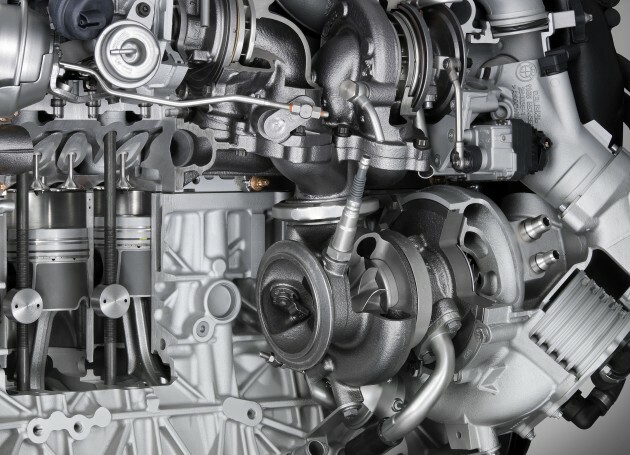 When BMW added the second turbo to the 3.0 litre and created the engine that powers cars like the 335d, the 640d and the 740d, diesel enthusiasts everywhere ogled at the promise of an extended powerband, which combines the best of both worlds – gobs of punchy torque immediately after idle, and a prolonged high which lasted up to a 5,000rpm redline – 300pm higher than before. As a comparison, the twin turbo 40d models made 306 horsepower and 600Nm of torque, compared to the single turbo 30d model’s 245 horsepower and 540Nm. The twin turbo setup combines a smaller turbo with a bigger turbo, that activates at different times according to need. Common rail pressure was also increased from 1,800 bar to 2,000 bar, while compression ratio stays the same at 16.5:1. And now BMW has taken it up a notch with the new 3.0 litre tri-turbo diesel, found in the M550xd, X5 M50d, X6 M50d and most recently the 750d. 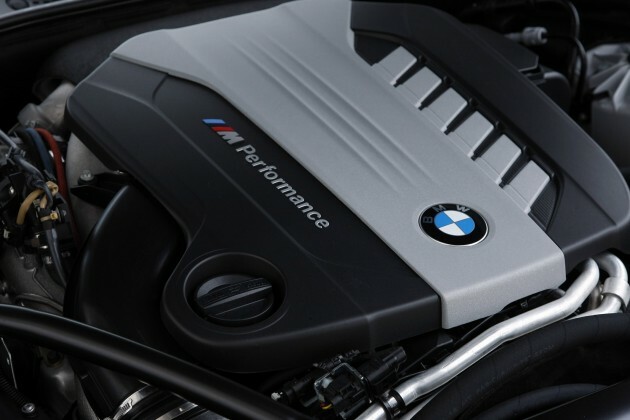 Thanks to three turbochargers, common-rail direct injection with piezo injectors (during each power stroke, three pre-injections, one main injection and four post-injections of fuel take place) and maximum injection pressure of 2,200 bar, BMW manages to extract 381 horsepower between 4,000-4,400rpm and 740Nm of torque between 2,000-3,000rpm, stretching the redline all the way up to 5,400rpm. The size, arrangement and interplay strategy of the three turbochargers are designed to produce high power delivery across a wide rev band. The system comprises two relatively small turbochargers and one large turbo, which join forces precisely to deliver the amount of power required. One of the two small turbos is activated at engine speeds just above idle. Its low moment of inertia allows it to respond without delay to the slightest movements of the accelerator and therefore supply the combustion chambers with compressed air at an early stage. As revs increase, the flow of exhaust gas also reaches the larger turbocharger, which announces its arrival with the engine spinning at just 1,500 rpm. To further increase the performance of the large turbocharger, a greater volume of exhaust gas is required at around 2,700 rpm. If the driver calls up additional power, a vacuum-modulated exhaust flap instantly opens up another supply route, allowing extra exhaust gas to flow past the already active high-pressure charger to the large low-pressure turbo. The third turbocharger – integrated into this bypass line – also has a low moment of inertia and variable compressor geometry, which allow it to spring into action as soon as the exhaust flap opens. The result is additional charge pressure, generated by two sources at the same time. The large turbocharger is able to deliver its full output, while the second small turbo builds on the effect of its two active colleagues by supplying even more compressed air to the combustion chambers. If the large turbocharger is spinning at particularly high speeds, a vacuum regulator opens a wastegate valve to relieve the pressure and so avoid unwanted exhaust backpressure. The supply of fresh air is also controlled according to need by means of pneumatically activated flaps. For example, at low revs a bypass flap ensures that the air is channelled directly to the high-pressure charger, which spins into action very early. At less than 2,700 rpm a change-over flap keeps the air away from the third turbo, which is not yet active, to prevent unnecessary fluctuations in pressure. And like the new M5’s petrol engine, BMW has decided to give the M Performance diesel engine some extra help with sounding good to the driver. The audio system’s DSP xchanges data directly with the engine management, allowing it to base its precise transmission of the engine’s timbre on the revs at any one time, the amount of torque being produced and the car’s speed over the road. This helps to add “emotional” appeal to the car’s sound, which you might not expect from a diesel engine, but personally I think the 6-cylinder BMW diesels sound pretty good on to go on their own, unlike the 4-cylinders which have good shove but sound so-so. In all the cars it’s offered in so far, the new tri-turbo engine is mated only with BMW’s 8-speed automatic – no manual rowing for you here. 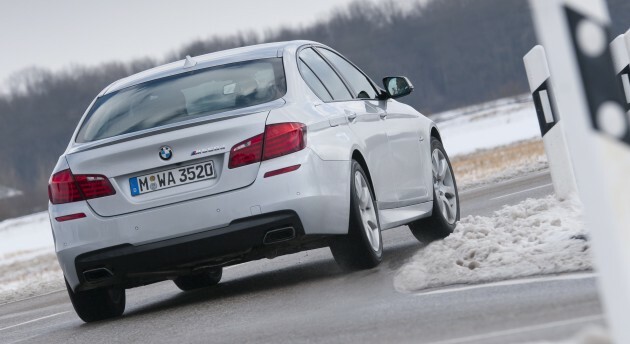 BMW also gave the M550xd, X5 M50d and X6 M50d M-specific tuning of suspension, bodyshell mounting, engine and transmission mounting, springs and dampers, and Servotronic mapping for the hydraulic steering. So it’s not a full blown M car like the M5, X5 M or X6 M with a bespoke engine and twin clutch gearbox, but you do get something pretty special. The trio also comes with xDrive only, which also means that you won’t see the M550xd brought in by grey importers as BMW only makes the xDrive F10 in left hand drive. The M Performance cars also get their own bumper look, which is kind of a derivative of the M Sport bumper of the respective cars but with the fog lamps removed and replaced with a horizontal bar. Look after the jump for a mega gallery of the new M tri-turbo diesel cars. Godlike. Can’t wait to see triturbos on their petrol siblings. driving so fast and reach 200+kM/hr!!!!!! It over kill us with turbo. How about the fuel consumption? not bad. Since Diesel has good fuel consumption, output torque and very reliable. It is awesome! Quad turbo? On the way! Nowadays diesel engine are getting more powerful, more silent and produce even less CO, than Petrol rival. EURO4/5 Diesel has less sulfur than EURO2. The sulfur is removed during the refining process. So unless you own a refinery, there’s no way to make EURO4 Diesel from EURO2 Diesel. my kancil can do better than that in its accelaration. of course can if you count it from backwards. Thanks to Karlz Benz of Mercedes-Daimler Benz. He created the first conbustion engine from diesel to petrol. they must study preve` CFE engine to make this tri turbo one..proud of preve` CFE engine!…even BMW do copy this CFE high performance engine! is obvious that you dono what you talking about ……. Are u daft? Comparing BMW with proton? Its like comparing adolf hitler with najib. dude, what’s wrong with you man? got turbo? I have 3 la brader!